“Many a man proclaims his own steadfast love, but a faithful man, who can find? If you haven’t already discovered it, you soon will. Making promises is easy. It’s keeping them that separates the women from the girls. Our Proverb for today says, “Many a man proclaims his own steadfast love, but a faithful man, who can find?” (Proverbs 20:6) To be faithful is to exhibit steady devotion and long-term dependability. The insight we find in this verse tells us that while we won’t lack for people who will profess devotion and dependability in theory; faithful friends are a rare find in reality. Over the last few weeks, we’ve seen Jonathan, Crown Prince of Israel and the subject of our friendship study, pledge himself to David in an intentional, committed and non-competitive display of friendship. As moving and instructive as these lessons have been, our schooling on extraordinary friendship doesn’t stop there. As Jonathan’s friend David enters years of hardship, living as a fugitive and hunted like an animal, Jonathan makes good on his touching commitment. 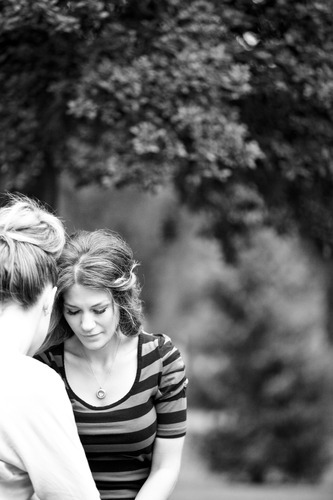 He models for us the rare quality of faithfulness in tangible ways that we can emulate in our friendships. Standing in the Gap. A short time after the budding of David & Jonathan’s friendship, King Saul is driven mad with jealousy over David’s military successes. He can’t seem to get David eliminated by covert & subtle means, so he voices to Jonathan and his servants his desire to have David executed. (I Samuel 18:9 – 19:1) If my life experience serves me correctly, I have found that it’s common for people to side with the most popular and influential person in the room, regardless of personal convictions that may be held to the contrary – especially if that powerful person holds one’s future in their hands. (Either vocationally, financially or socially) That being likely, I’d wager that on the execution plan, there were a few takers among Saul’s men. While bucking popular opinion or being in the minority may cause some of us to hang friends out to dry, that could not be said of Jonathan. By having the personal integrity and courage to speak truth and introduce logic back into an emotional situation, Jonathan draws attention to David’s innocence, sacrifice and public service. By doing so, in this instance, Jonathan is able to restore peace between two opposing friends – a noble accomplishment. (I Sam. 19:4-7). It doesn’t turn out quite as well the next time he has to do it (I Sam. 20:30-34) but I think the outcome is almost secondary. I once stood in the gap for some friends and things didn’t turn out for them as I had hoped. But this was certain – they knew my love for them and that’s what I had control over. Standing the gap implies a willingness to expose ourselves for the protection of someone else. How are we doing in manifesting this aspect of faithfulness to our friends? Keeping Our Word. The peace between David & King Saul was a fragile peace because after another stunning military victory by David, Saul is driven anew into jealous rage. Reneging on his oath to preserve David’s life, Saul launches a multi-faceted, private campaign to have David killed. This time, without Jonathan’s knowledge. David, on the run, comes and finds Jonathan for answers. We’ll discuss aspects of that conversation next week, but I’d like to draw our attention to a set of mutual commitments Jonathan and David make to one another in these tense & emotional moments. As we see later in the narrative for both of these friends, these are commitments they kept. It cost David some kingdom security and monetary resources as he dignified, fed and housed Jonathan’s crippled son. And it cost Jonathan respect in his father’s eyes, violence at his father’s hands and ultimately his own kingship. In one of David’s Psalms, he penned this line describing the kind of people who will enjoy nearness to God and stability in life: “He who swears to his own hurt and does not change.” (Psalm 15:4) That means that we keep our word, even when it costs us. It wouldn’t surprise me if he thought of Jonathan when he wrote that. The older I get, the more I have collected friends who, like David, walk a hard journey that shows no sign of letting up. I used to back away from those friendships because, as a woman of action, those unresolved situations made me uncomfortable and made me feel like a failure because I couldn’t change anything for them. Now I’ve grown to see that, like Jonathan, there is much I can offer to long-journeying friends, if not a solution. Our presence, our encouragement and the promise of continued companionship despite the road’s valleys and distance is a gift that any of us can offer. Stand by a noble friend when she isn’t popular. Speak truth and stand in the gap for restoration. Come when we say we’ll come. Help when we say we’ll help. Finish what we said we would. Support when the road is long. And love no matter what it costs us. Many a woman proclaims steadfast love, but how about we live it instead? You make it awfully easy! Wonderful truth as always, Janet. You’ve challenged to check myself here. Thanks for writing the hard stuff. Yes, it is hard stuff! Why can’t I get a publisher so I can write whimsical children’s books instead of convicting blogs??!! 🙂 Sheesh. I have recently started reading and enjoying your blogs. What I appreciate most about this blog are your points at the end regarding what we should endeavor to do. You say that we should stand by a noble friend. This is not the same as standing by our BFF even if she is in the wrong or sinning. Jonathan spoke to both sides and determined the truth and then stood with his friend whose behavior was righteous. You then make the points that we need to speak truth and stand in the gap for restoration. I praise God for friends who will speak truth, say the hard things I need to hear, and then stand beside me. My favorite point of all, we stand in the gap for restoration. As believers, our goal always needs to be restoration, reconciliation and forgiveness. Saul tried to kill David, but when David was given the opportunity to kill Saul, he did not take it. As a matter of fact, we see David prostrate himself before the king and again seek reconciliation. David and Jonathan have an amazing friendship because they seek God and His righteousness first and their friendship is the blessing of their selflessness. There are very few examples of friendship today where women speak truth, stand firmly together and continually seek restoration. Thank you for encouraging us to have those friendships and be those friends.